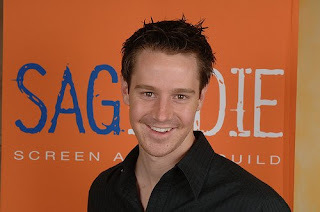 This is Jason Dohring in the middle of a difficult conversation with KBell while they are playing Logan Echolls and Veronica Mars respectively. 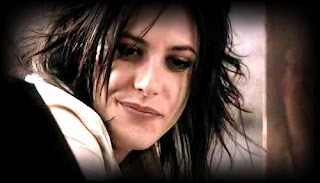 This is Katherine Moennig wearing some stupid-hot glasses playing Shane on The L Word. 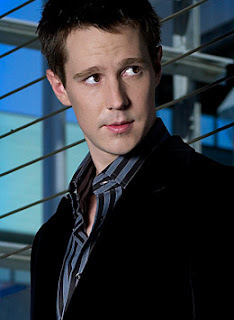 This is Jason Dohring being evil on screen. Whoopsie, evil again, this time on the short-lived Moonlight (now available on DVD and Blu Ray [but why would you want to buy, you can get all the hot JD moments online for free]). Logan Echolls, about to commit vandalism on a poor, defenseless Le Baron. KM, possibly thinking about surfing. Or me. Hi Kate! And last but not least KM with her hilarious rescued pooch. I'm hard pressed to say who draws the eye more in this photo. They look glorious together. I figured you just needed to know where they came from. What you do with that knowledge is up to you. L Word is seminal media (that seems so the wrong word to use there) for lesbian culture but it's unbelievably badly written. Still riveting but a lot of willing suspension. The first season of Veronica Mars is, possibly, one of the best seasons of TV ever put together and is surely the best season of a teen drama ever made. Great mystery, great characters and at least one truly phenomenal parent. Ahhh! That clears things up a bit. Thanks! I wish you would get over Shane. You can do so much better! What about Carmen? That girl would rock your world! Do you love Shane more than you love me? Oh hell no, not Carmen. Doesn't do a thing for me. 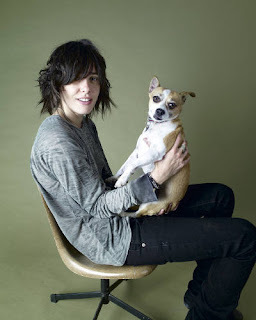 At this point, since the writing is so bad (haven't seen the final season yet, no spoilers please) it's less about Shane per se as it is about Katherine Moennig who is a really interesting person and, bonus, looks just like Shane. How could I ever love Shane more than you? I'd have to say the one season of My So Called Life was a better season of teen drama - but I do love my Veronica Mars! Moonlight was truly terrible. He was the only redeeming feature of that show.